Every email has a purpose. That purpose, if you’re in digital marketing, should be singularly focused: thanks for signing up, have a coupon; here’s a roundup of what we’ve been up to lately; happy Thanksgiving, enjoy a free holiday marketing ebook. Perhaps nowhere is this philosophy more apparent than in drip campaigns. Drip campaigns, if you’re unfamiliar with the term, refer to any automated email campaign that “drips” to the customer in a steady fashion. The most common is a series of welcome emails after they first subscribe. For example, your first email might be a notification that their free ebook has arrived. Your second email might come five days later, asking how they enjoyed the ebook. The third might come a few days after that, asking them to pass on the love by telling their friends about your amazing ebook and urging them to sign up, too. There are more complex drip campaigns, of course, and they don’t all involve holiday ebooks. What they do share are four common steps: definition, identification, creation and reflection. We’ll dig into each right now. DEFINITION: WHAT’S YOUR CAMPAIGN FOR, ANYWAY? Are you trying to convert new leads? Are you rewarding existing customers? Are you boosting sales in a typically slow season? You can (and should, really) have multiple drip campaigns for multiple email groups, depending on who you’re talking to. All of the above scenarios can absolutely coexist. But you have to start with this groundwork: define your goals upfront and the rest will become a whole lot easier. Often, when people give you their email address, they expect something in return. A good practice is to give them that thing immediately. If they’re customers at your clothing store, you might draw them in with a coupon code for 25 percent off their next purchase. That coupon should be the first email those customers receive. The second might be a reminder if they haven’t redeemed it yet, or a thank you note with related products if they have; the third could be a customer service survey with another coupon as a reward. 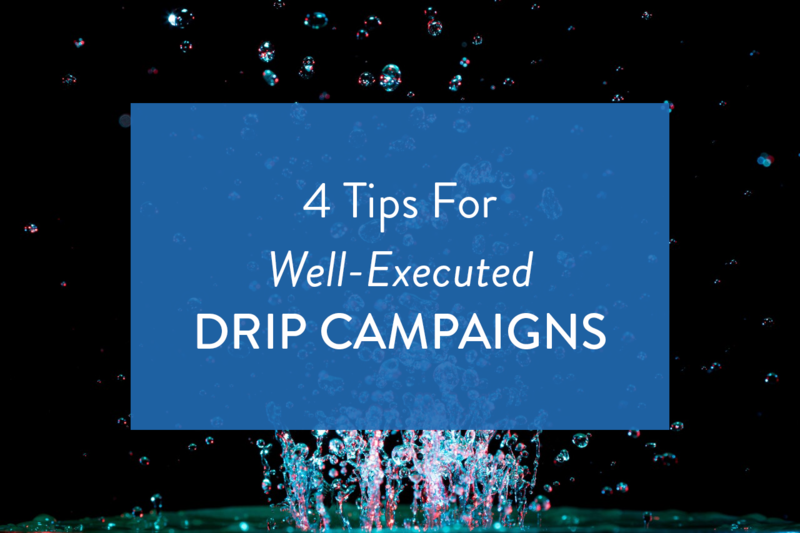 A successful drip campaign needs to only be a few emails long—two or three is perfect. If you don’t have a lot of value, don’t stretch it. There’s little more annoying than receiving daily drip emails for a week straight. We’re not saying this is necessarily bad email marketing, but five emails in the first two days is… a lot. If you’re looking for ideas, the best way to do research is by signing up to other email newsletters and seeing what they do. We’re not suggesting you mimic their ideas, exactly—but all great artists borrow sometimes, right? Once you have an idea of what you want to achieve with your overall drip campaign and specific emails, you should…actually create them. Designing a drip campaign is pretty easy with CRM and marketing automation tools like Hatchbuck. You can set up the emails to be sent immediately after someone subscribes, 24 hours later, one week after the previous one was opened, or according to any other criteria you choose. You can set the timing, frequency, design and wording to match both your company goals and specific email purpose. A successful drip campaign can extend beyond your initial meeting, too. You can set one up to follow ebook launches, holiday campaigns and subscription notices—anything that you feel deserves a follow-up. We’re big fans of split testing here, and that’s an important part of any email marketing campaign. If you agree that there’s always room for improvement, then you should pay particular attention to drip campaigns. These are fundamentally powerful, targeted moments of outreach, and can produce the highest engagement results of any email campaign. It’s crucial to pinpoint exactly where you might be missing opportunities because a button isn’t clear enough, or your language isn’t quite right. Keep tweaking your email drip campaigns, and you’ll find your engagement and open rates climb significantly over time—along with the success of your marketing efforts overall.